Kansas City, MO: Howda Designz announces that it is the proud recipient of the 5th annual 2017 EDspaces Innovation Award in Seating from the International Design Association (IIDA). Winners of the 2017 IIDA awards were announced on October 26, 2017 at the EDspaces tradeshow and conference in Kansas City, Missouri. 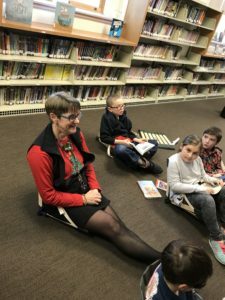 Recognizing manufacturers for excellence in product design for the learning environment, the EDspaces Innovation Awards include categories in flooring, furniture, seating and equipment. Howda Designz, innovators of the HowdaSeat® and HowdaHUG® , announces the addition of two new calming colors of HowdaHUG® seats: Calm Olive Green and Calm Natural. Kids feel calm and safe in HowdaHUG®seats – the ultimate, portable, floor time rockers. Made of wood and canvas, HowdaHUGs support children’s entire body, wrapping them in a gentle “hug” embrace. This gives children a sense of security without constraint. “Kids will love taking a seat with a HUG!”, says Leslie Novak, owner. Since then, HowdaHUGs began filling the special needs of school children who were finding it difficult to sit peacefully. Grants coming in from schools for full classroom seating have confirmed how all children benefit from HowdaHUG seats. 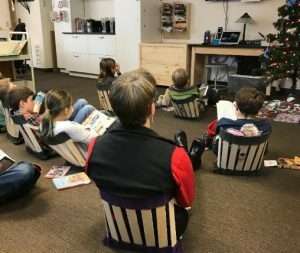 Teachers report that children sit longer in “cradle-like” comfort with proven increased attentiveness, eye contact and focus. HowdaSeat® and HowdaHUG®seats are handcrafted in Maine of quality, renewable hardwood and cotton canvas. Safe for children and for the environment, our seats are designed with strong, non-fidget, adjustable straps to give each child the sensory embrace to feel calm.These patented seats have a durable interior cushion inside the bottom hinge to protect the canvas from wear when rocking on rough carpet, wood flooring or the ground outside. Our lightweight, roll up seats tote easily and stack flat for storage, making them ideal for classrooms.